Dormition of the Holy Virgin is a Catholic holiday that celebrates, through a feast, the Virgin, the mother of Jesus Christ when her spirit and body went to heaven. This holiday happens on the 15th of August each year. Most Catholics go to church and attend to festivals that have many sporting events, parades, markets, and communal meals. This holiday is a public holiday, so schools, offices, and businesses are closed. 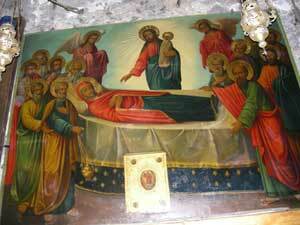 Dormition of the Holy Virgin ( or Assumption of Mary) was the day when the mother of Jesus Christ departed from this life and assumed into heaven.